Quilters who love fabrics inspired by the Civil War era save every scrap and this designer applauds them - she saves every scrap too! 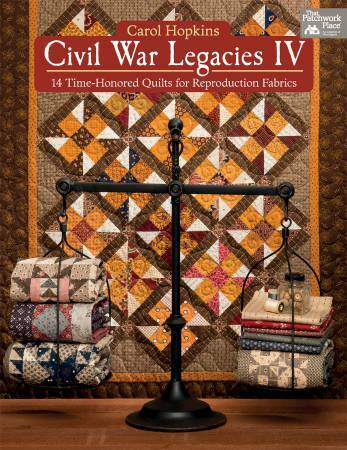 This 4th book in the Civil War Legacies series is a collection of small, spectacular quilts where every scrap saved has an opportunity to shine. Make a quilt honoring the Blue and Gray Trail, choose a stunning tribute to the woman who established the American Red Cross, stitch a sampler chock full of charming Basket blocks. Along with 14 exquisite designs to make step-by-step, quilters will enjoy reading little know facts about the Civil War and stories about how each stunning little quilt came to be. Rich, close up photography shows every fabric choice in detail. 80 pages.